Speaking in a televised press conference from his Downtown Beirut residence packed with members of his party, media figures and other officials, Hariri said he made the decision not for himself, but for Lebanon as a whole to preserve the state, institutions and security. “Based on the points of the agreement we have reached, I announce today before you my decision to support the candidacy of Gen. Michel Aoun for the presidency of the Republic,” Hariri declared to loud applause. “Gen. Michel Aoun, according to the rules that we agreed on, is candidate to be the president of all the Lebanese,” he added, the Daily Star reported. Hariri, a former prime minister, could likely return to the premiership under the deal brokered with Aoun. However, he did not address this point publicly. “This is not a settlement, this is a sacrifice. … It will not be the first time nor the last that we sacrifice our political and popular interest for the nation, the state, and stability,” Hariri added. Animosity between Hariri and Aoun, an ally of Hezbollah, dates back more than a decade, and many members of Hariri’s Future Movement have openly expressed dissatisfaction in recent weeks with reports of the forthcoming endorsement. Aoun, the founder of the Free Patriotic Movement, still faces obstacles for being elected in an Oct. 31 Parliament session set to vote for a president. Future MPs Ahmed Fatfat, Fouad Siniora, Farid Makari and Mohammad Qabbani were among the first to announce they would not be voting for Aoun in the upcoming session following Hariri’s endorsement. Long-time Parliament Speaker Nabih Berri, who heads the Amal Movement, said Wednesday he also would not back Aoun. 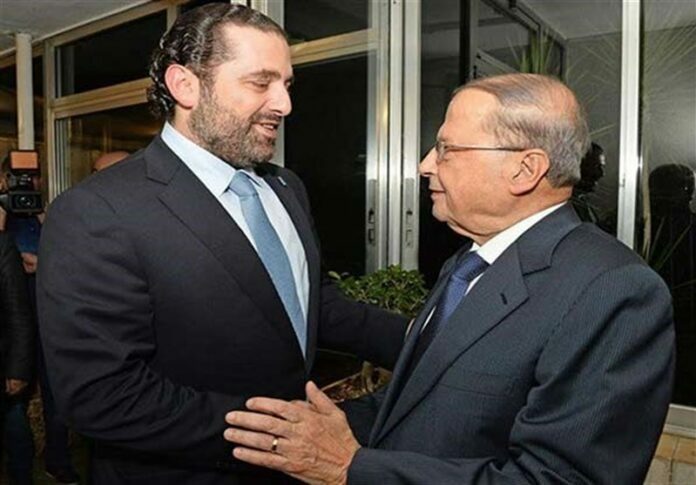 Aoun thanked Hariri for the endorsement in a press conference from Hariri’s residence about two hours after the announcement. Speaking with the former premier standing beside him, Aoun acknowledged that differences would remain between the country’s rivals, but said that was “normal” and defined democracy. But, he added, “we cannot remain in dispute like we were in the past. We can’t build a future if we keep looking at the past,” appealing to his rivals to be “helpful” in the interest of the country. “We are not coming to be casualties, we are coming to win the battle for Lebanon,” Aoun added, urging those opposed to him to hold judgement until they viewed his performance. Following his visit to Hariri’s house, Aoun held a short meeting with Berri in Ain al-Tineh, apparently without result. “Of course we asked for Speaker Berri’s support, but ultimately we respect his freedom of choice,” Aoun told reporters in a brief press conference following the meeting. In his endorsement speech, Hariri underlined that Aoun was not his first option for the presidency. He had originally endorsed Samir Geagea, a member of his March 14 political coalition, before shifting his support last year to Sleiman Frangieh, a member of the rival March 8 coalition. But, he said, when those endorsements didn’t work out he was forced to consider what would befall the country’s Cabinet, Parliament, economy, security and people should Lebanon remain without a president any longer. “The economic, financial and monetary crises we are experiencing and the security risks that lie ahead can only be resolved, even if momentarily, through completing the constitutional institutions, starting with the presidency,” Hariri continued.